Gold had a rough first half of 2018, but the precious metal has been rallying nicely since equity market volatility picked up in Q4. 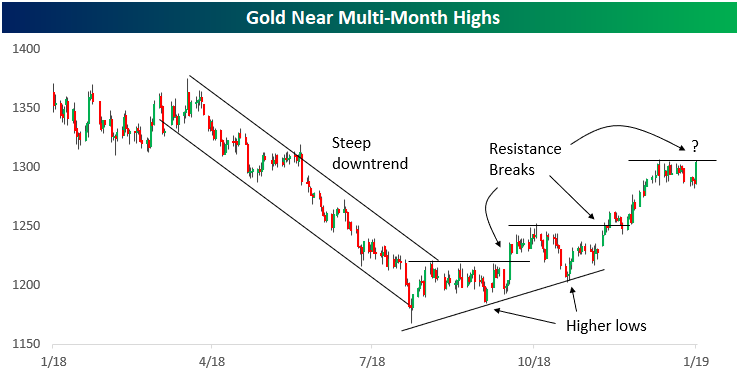 After making a bottom in mid-August last year, gold has taken a number of bullish technical steps to put it in a new multi-month uptrend channel. As shown below, gold first made a series of higher lows and higher highs to end 2018, breaking two key resistance levels in the process. It has made another big leg higher over the last month or so, and after a slight dip over the last two weeks, today it has popped once again. As of early afternoon trading, gold was testing another resistance level and trying to make a new rally high. If this resistance can be taken out today or early next week, gold bulls will be looking for yet another leg higher.